Help! What do I do with these old paint cans? I came to this dilemma after cleaning out the garage this weekend. 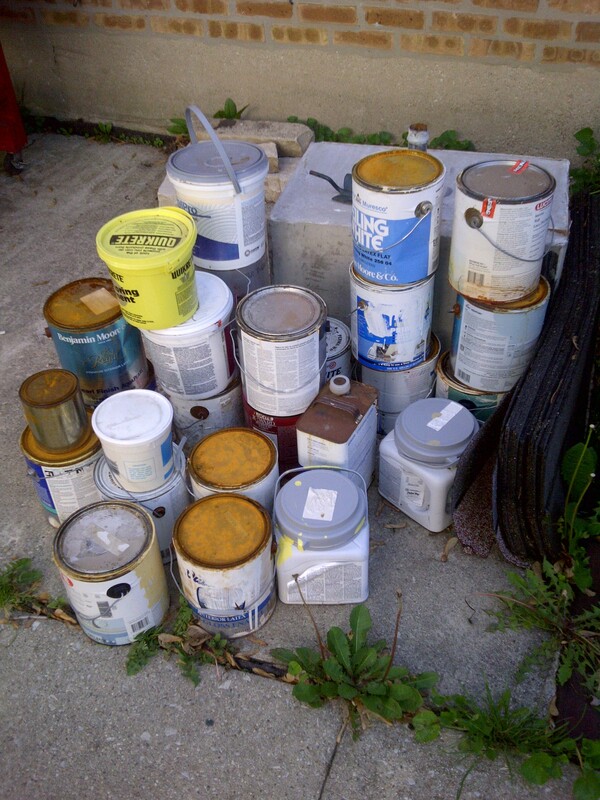 I had 15 gallons of old paint sitting on the patio, and I had no idea how I should dispose of them. I went to the website of my hometown and found a list of recyclables, times and pick-up dates; however, there were no instructions on ridding me of old paint. This may sound simple, and it is. What better place to put that last pint or so of paint but right up there on the wall where it blends in perfectly with all the other paint you just put up there. Sure, it’s a little extra work – and right when you thought you’re done for the day – but you’ll be rid of that extra paint for good. Simply let the can dry and then recycle or dispose of it. It doesn’t even have to need the paint. Use an old piece of cardboard, some scrap lumber, or the inside of your garage. Just about anywhere would probably work to use up that last bit of paint. Again, let the can dry and recycle or dispose of it. Use an Absorbent like Kitty Litter! Kitty litter, sawdust, shredded paper or just about anything else that will absorb moisture and let the paint dry out should work here. Depending on how full the can is, you can just add the absorbent to the can and mix it up. When the liquids are absorbed, dry the mixture out or dispose of it directly. You may be able to empty the can, dry it out, and recycle it. Look around and you may find somebody who needs to paint a small area. Some schools or local theatres will take some small amounts of paint for scenery. Everyone has good intentions to use half-filled paint cans for “touch-ups” that never come. Also, many people have saved paint that becomes unusable over time before it’s called into action. If you do save your paint for later, follow some easy tips to make the paint last longer. Just cover the opening with plastic wrap, and make sure the lid fits securely so the paint doesn’t leak. Then turn the paint can upside down! This creates a tight seal, and keeps the paint fresh to use again. This is an interesting list of things to do with my old paint. I already had a few cans that were dried up so those could go in the garbage. The paint that was still wet, could be taken to an Ace Hardware a few miles away and they would dispose of it for $5.00 a can. What a racket! Nevertheless, this was a list for latex paint that is water-soluble. What about the oil based paint and stain? I learned on the same Illinois Environmental Protection Agency website that oil based paint and stain had to be taken to a Household Hazardous Waste Collection event. After a little more research, I found out that my town was not scheduled to have one of these little events until June. The only “event” I could find was in a town 50 miles west of me. Hmmm…So, I set out to rid myself of this hazardous waste. Luckily, gas was cheaper in this town’s county, so I guess it was a good thing I went 100 miles round trip to get rid of three cans of old paint. All this work seems a bit excessive to me. If paint is going to be sold, and disposal is an issue that must be dealt with, then why don’t the stores I purchase the paint from have a disposal service? Just asking. The research I did was for waste disposal in Illinois. Your state may have different rules for disposal. I suggest you visit the Environmental Protection Agency from your individual state if you have any questions about paint disposal or any other hazardous material disposal. By the way, do not even ask how to get rid of old tires, fluorescent bulbs, or electronic equipment. We will leave that mess to another day. Posted in Helpful Hints on Everything and tagged environment, garbage, hazardous waste disposal, Helpful Hints, Illinois Environmental Protection Agency, old paint, postaday. Bookmark the permalink.